Just as in all motorsports, BriSCA F1 race control communicate signals to the Drivers via a combination of Flag Marshals around the circuit, and of course via the Chief Starter in his box on the start/finish line. 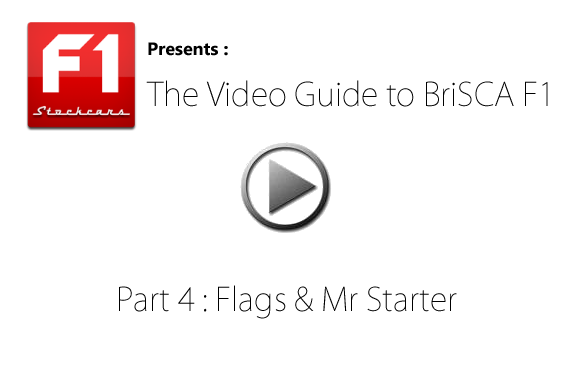 For the most part, the BriSCA F1 flag system is the same as all other motorsports, but there are a few subtle differences. Green – Start (or restart) of race. Yellow (held static) – Localised incident, reduce speed and prepare to avoid track blockages. For many years the Chief Starters at BriSCA F1 race meetings have been affectionately referred to as ‘Mr Starter’. This term of endearment is probably linked to the fact that a starters role in the race is ingrained into the entertainment of each race as much as the drivers themselves. If the drivers and their cars are the orchestra, then the starter can be seen to be the conductor, keeping each race flowing freely, making sure the racing is hard but fair. Each stadium or promoter normally have their own starter, and each have their own individual style and traits which they bring to the sport. As well as the responsibility of making sure the race starts properly, with no driver getting the jump over any other, and as well as maintaining the safety of the drivers through the use of safety flags, the starter also has two other important jobs. Keep your eye on the starter and you will clearly see that with the start of each new lap he makes clear arm gestures to point out the top 3 placed drivers in the race. As the race laps count down he will then also start to hold out long white ‘lollipops’ to countdown the last 5 laps in the race. In this fantastic video recorded at the Kings Lynn circuit, you get the rare chance to watch their ‘Mr Starter’ at work during the closing laps of a race, pointing out the top 3 placed drivers, and using the lollipops to countdown the race. It would be stating the obvious to point out the guts required to do this job.